In this booklet Bill recounts the history over more than 400 years of the building and the two principal families connected with it, the Garths and the Hatfeilds. Illustrated with drawings, maps and a family tree. Cover illustration from E. Walford’s Greater London 1883/4. was disposed of to British Restaurants and Civil Defence Canteens. for an annual film stars’ garden party. The Merton and Morden U.D.C. opened as a ‘Beefeater’ restaurant and conference centre. collected by Wm. Berry, Registering Clerk in the College of Arms. in 1540, when it returned to the Crown. the young king died and was succeeded by his elder sister, Mary. he was to survive the vicissitudes of the times. church, including a newly-built manor house called Growtes, on 7 March 1554. Hall Garden Centre car park. ceased to be the manor house of Morden. The Garths moved elsewhere. 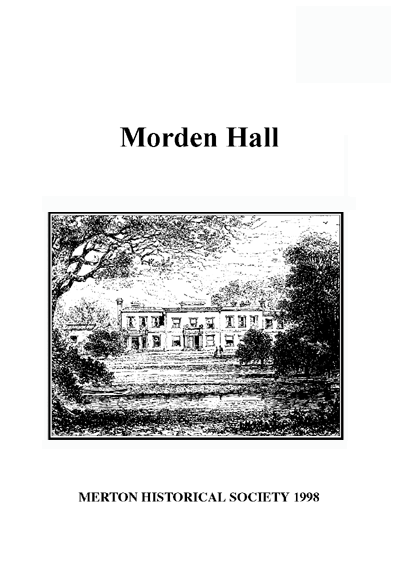 son succeeded to his estate as lord of the manor as Richard Garth V.
occupied, though separate from what was to become the Morden Hall estate. of his wife in 1780, Richard Garth V moved to a house in west London. as lord of the manor, but not the inheritance. had married his cousin Clara Lowndes, who died 15 January 1903 aged 78. He died of grief 25 March 1903 aged 83, and both are buried at Morden. demolished, some adapted for other uses and new buildings were erected. ultimatum, the owners closed down the business. and earned the love and respect of all those who came in contact with him. His monument in St. Lawrence churchyard reads ‘Faithful to his Trust’. housemaids and a kitchen maid. June 1873 as a surrender from Thomas Nickalls White to Gilliat Hatfeild Esq. of Morden. Thus it was the end to Morden Hall Academy after over 40 years. further afield and abroad. The house was to return to being a private residence. Hatfeild, Henry Back and Friend Williamson. And again in 1859 by Rev. Richard Garth to Alexander and Gilliat Hatfeild, of the Minories. in the 18th century in Fenchurch Street, and later moving to 45 The Minories. son in charge of the Morden Hall mills. moved with his family into his manor house. Jos. Daniels esq. on the site of Morden Hall, appears on a map dated 1823. Nothing is known of either of these two gentlemen. no sons to succeed under the provisions of the will of Richard Garth V.
details and academic qualifications have proved to be extremely elusive. lease shows a lawn to the north separated by water from the island meadow. To the south was a large garden separated by water from the kitchen garden. extra assistance in a variety of tasks came from the local community. Lowndes changed his surname by Royal Licence to Garth. Dorothy = Richard Garth (II) = Beatrice ……….. This entry was posted in Publications, Booklets, Publications and tagged in 17-century Morden, 18-century Morden, 20-century Morden, morden, morden hall, tudor Morden, wandle.